1. You get dirtier in Ride and tie. Much much much dirtier. I have very white legs. This is not a tan. 4. War wounds are the norm at RnT…. 5. You’re done before lunch, have time to drink 2 beers before lunch, eat heartily and still have plenty of time to drive home. 7. Galloping and cantering into camp is totally acceptable. 8. No one asks you if something is wrong when they come up behind you on horse back running all by yourself. 9. There’s lots and lots and lots of yummy people food snacks on the tables for us hard working runners!!!!! And the water trough on the trail including a table full of snacks and gatorade that was more reminiscent of a trail race or marathon. 10. Everything is less work with 2 people and 1 horse…..
11. Every thing that can rub will rub. Even if it’s never rubbed before. I practically bathed myself in chamois anti chafing lotion at the vet check. 12. Make sure you can mount and dismount from both sides in a COORDINATED fashion, while the horse is walking/trotting off, under PRESSURE, after sprinting up a hill. Yeah……my first couple of mounts from the right side felt like some weird form of trick riding. In some cases, only my upper arm strength that I’ve been working on kept me on the side of the horse, semi on top as we trotted away as I tried to convince my left leg that it could swing up just as well right leg when mounting from the other side! Everything started well. I got to M*’s house on time, helped load stuff into the truck and fed the rest of the animals. Stasi had been bathed, groomed, and fed and ready to go. The trip over was uneventful –> M* went to check in and set up the horse trailer for Stasi, and my bedroll for the night. Because I have the most awesome partner she knew what it was. Do you? I finished off 2 beers and headed off to bed. I asked M* whether Stasi needed a refill on his hay bag for the night, and we both looked at his errr….pudge and she said that he had been eating all day and did NOT need more hay. So we went to bed. Stasi took issue with this decision. At almost 20 years old and being EXTREMELY experienced at this RnT thing, he knew how the game worked. He gets unlimited hay. 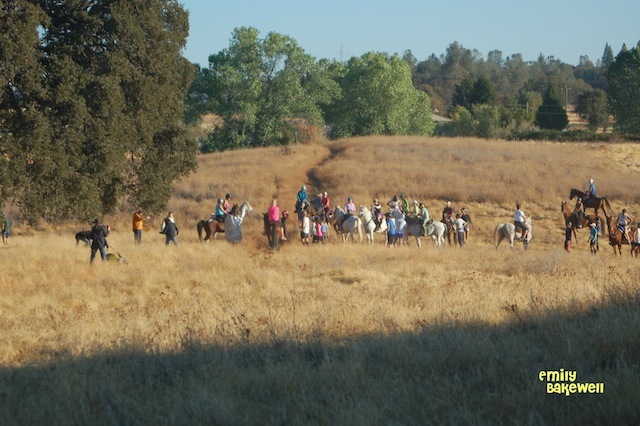 Then he carries his riders through the course as fast as he possibly can while standing quietly at trees and bushes waiting for the next exchange. The cost of this little game is unlimited hay. And some grain. At 11 pm Stasi decided to remind us that we had “forgotten” his night ration of hay. “What the”…..I did a chin up to the top opening of the trailer and didn’t see Stasi. I ran outside. No horse. I ran to the back of the truck and tried to wake up M*. No answer. I started poking at blankets only to see her walk towards me with Stasi. Stasi was returned to the trailer, given a new lead rope, and a full ration of hay. I got up around 7pm and wandered around making coffee. Ride meeting was at 7:45, Ride start at 8:30. The plan was to take Stasi up at 7:30, go to the ride meeting, and then change into our riding gear, etc. We went up to the main area and munched on good things, ignored the begging Tess and checked our watches. As usual it seemed like the ride meeting was going to start late. Then ride management shouted that they were changing the ride meeting to 8:15. CRAP!!!!! By this time it was only a couple minutes before 8:00am. We tried our best, but also didn’t want to hurry to the point where we forgot something vital. It had been a couple of years since M* had done a ride and tie and this was my first one. It was worth the time to make sure that everything went right. This is a picture of the start. If you look very carefully…..you will see we aren’t there. We started about 3-5 minutes late. In endurance terms this would be “typical” for me, knowing I could make up the lost time. In Ride and Tie terms, this was time that could not be made up, and probably cost us a placing or two at the end of the race. The first 9 mile loop is a blur. 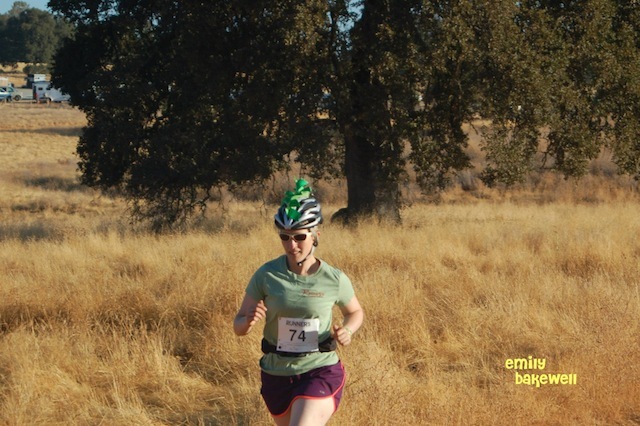 Considering that my 10 mile PR on a flat course is about 1:42, and we did this 9 mile hilly and rock loop in 0:57, you can see that we were FLYING. I ran as hard and fast as I could, and we I got to Stasi, I cantered and galloped before handing off to M*. About 3/4 into the loop I was dismounting and my left food came down on a large rock and I twisted it. Badly. *&(*^&^%^&(()@[email protected]@[email protected] As long as I landed perfectly centered on my ankle, there wasn’t pain, but that was a neat trick as I catapulted along uneven dirt and rocky trail. 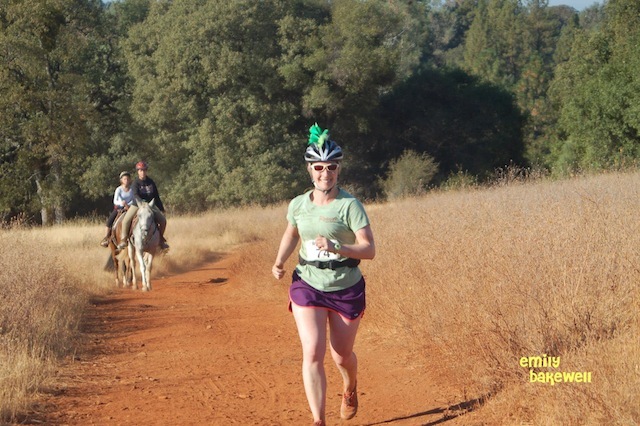 I galloped into ride camp –> only 4 miles left. No hold, just a vet check. We were allowed to tie to a trailer at the check (usually only natural objects allowed) and I sponged, water, fed as I waited for M* to run in. When she came in I grabbed her water bottles and mine, refilled and then hit the trail at a dead run. If Stasi got pulled, M* would send word with another rider and when they caught up to me, they would tell me and I would turn back. I ran for what seemed a really really long time. It’s not very motivating knowing there isn’t a horse in front of you. And I didn’t see anyone else and we didn’t know where we were in the pack that was doing the 14 miler so it was entirely possible I was going to do the whole stinkin’ 4 mile loop all by myself. Fortunately Stasi and M* cantered up behind me and passed me on their way to another tie. Again, I don’t remember much of the loop, not because we were flying (it took us an hour plus a bit to do this one), but because my ankle hurt, my cardio was maxxed out (usually my strength is what maxes me out going up hill but I’ve really been focusing on strength training over the last couple of months and cardio was my limiting factor) and was running a constant effort rather than a constant speed or pace. Stasi decided that it was time for us to GET GOING and wasn’t being very cooperative for M* to tie. Finally we were near the end. 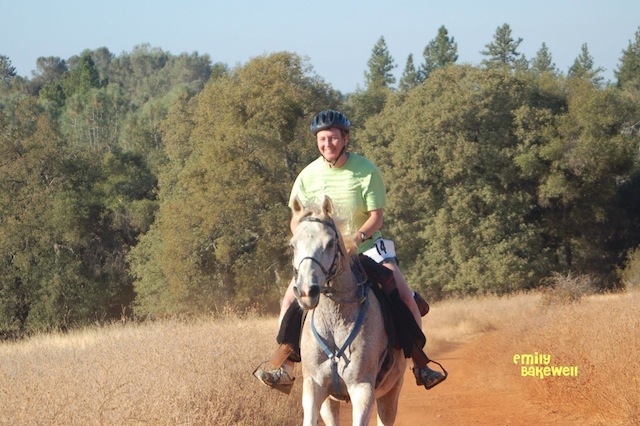 I decided that we were going to have a picture perfect finish, even if we weren’t in the start line photo and cantered up to M* and yelled “let’s finish together”! Well…the sentiment was there. Stasi was having no part of this and to my dismay we kept right on going past the in timers. DARN IT. I was at LEAST going to turn around and WATCH my partner finish!!!!!! Stasi threw a hissy fit and threatened to buck. I made a rude comment. I turned to walk him back to the trailer, across the road. Stasi decided to trot across the pavement. I told him in no uncertain terms that we were WALKING and MADE HIM WALK, much like what I DIDN’T do at the end of the race with M*. Stasi tried to throw a hissy fit and succeeded in tripping and going down….down….down. 3. M* is going to kill me for laming her horse right before the vet in. 4. Serves Stasi right for throwing a hissy fit. Stasi is super balanced and had never even tripped on me, even cantering down hill so I stayed on and he recovered and looked a bit trite. When I got back to the trailer, I noticed the tie rope was wrapped around his rein and probably explained why I had a hard time pulling him to a stop, and making him walk. M* vetted Stasi in, and then we sat down to have yet more beers, while I iced my ankle and contemplated the last couple of hours in which I had had more fun on horse back than I can remember having in a long time. I love 100’s, but if I’m being honest, while there may be moments of fun and enjoyment and peace within the 100, overall the experience kinda hurts. And there’s times of very low motivation. The reward comes with the accomplishment and the bond with the horse. RnT is a completely different kind of experience and while my plan is to do at least one more LD with Farley, my thinking is that I would rather do 25 miles of RnT than the LD’s, or even 50’s. Just enough 50’s to get my 100 in every year or so, and RnT the rest of the time, as long as I’m capable of running. M* and I sat down and compared battle wounds. She had a long bloody gash on her arm where Stasi had rubbed her into an errrrrr…..tree (what we agreed the story would be….) during a tie near the end of the race, and I had my stupid ankle. The lunch ticket was good for a personal pizza, salad bar, and a drink at a local pizza place which was DELICIOUS. After lunch we had some extra time before awards so went to check on Stasi and clean up camp so we could leave right after the ceremony. We returned to Stasi napping. With his nose in the grain bucket. A subtle hint that he would now like some grain thank-you-very-much. (I swear this horse is more like a dog than a horse. He problem solves. He attempts to communicate with another species. He’s not people oriented or particular affectionate, just rather a wee bit manipulative. In short, he sorta reminds me of Tess…). M* and I placed 6th in a field of 10 teams in the 14 mile distance, all 10 teams finishing within about a 30 minute window. I got a pin in addition to a cup because it was my first event. Now, a day after the race, my ankle feels stiff but much much better. I think I’ll be running on it by the end of the week no problem. I’m surprisingly not sore at all. There’s a bit of “deadness” in my calves and quads, but not soreness. I had planned on giving myself the day off, but I find myself on Martin (my walking tread desk) writing this post because I just can’t sit down any more and I’m getting fidgity. I think the LD a month ago, combined with the fast 10 mile running race (both events left me so sore I couldn’t walk without wincing for days) set me up very well, not to mention my intervals and strength training. I think I need to bump up my interval training in both intensity and duration and make a point to get out on the trails for a run once a month. The most dangerous part of the sport is probably the mounting. I almost lost my balance and grip and got dragged during my first mount, and I’m completely covered in bruises from head to toe and every nail is torn and broken on my hands from the 20+ mounts and dismounts that occurred during the race. Not to mention dashing through the tall weeds and star thistle to GET to the horse and untie it while avoiding branches and brush and manzanita. No event post would be complete without Brittany pictures! Here’s Tess striking her best Brit poses. 1. I wanna try this now! Feeling like I’m being chased is about the only way I end up liking running… All those years of being chased with weapons while playing a rowdy game of Capture the Flag will do that to you. 2. Play by play of Stasi hissy fit = hilarious. 3. Last photo of Tess with lips all akimbo = hilarious and adorable. Damn, that sounds tough! But what an awesome writeup, so fun! Mounting from the off side is tough unless you practice all the time (which reminds me I need to practice more.) Stasi sounds like a handful, good job during his meltdown (what a brat). In Stasi’s defense, he is hands down the most fun horse I’ve ever ridden. Even more fun than Farley. Farley’s stride is too rough, she makes me give too many half halts, and she takes herself WAY too serious at a competition. I love her dearly, but Stasi is FUN. For a 20 year old guy who probably thought he was retired, to be asked to drag yet one MORE newbie through a RnT, he probably thought his obligation ended at the 14 mile mark. Michele – don’t mind people posting for sale items in the comments at all. Also – there wasn’t a photographer at the finish anyways (only saw one finish photo and it was someone behind us) so I guess we can call this a dress rehersal :). Wow, that actually sounds like fun! I’m going to send my friend a link to your blog- we’ve been doing some LDs together but she’s interested in trying out RnT too. I think you described Stashi better than anyone ever has – I’m pretty sure he’s taken more newbies into their first ride and tie than any other horse. We should figure out how many newbies stasi has carried across the finish line! After my final of course. Because what I don’t need is yet another reason to procrastinate!